Artificial Intelligence (AI) - Know what machine with mind can do for us! Using probability and economics machines are able to imitate step-by-step reasoning to solve the problem. Using rules, ontologies, and engines to create a knowledge representation to automated reasoning. Using algorithms that improves itself with learning with (supervised) or without (unsupervised) human intervention. Using Natural Language Processing (NLP) for enabling the machine to read and interact in human language. Using electronic devices such as sensors, microphones, signals, sonar, etc. as input to interact with the world. Using robotics technologies for motion and manipulation. It seems that the limit is limitless with machines making breakthroughs in all aspects of human life's reaching 'Narrow Artificial Intelligence' (system able to handle one task at a time) and heading toward 'General Artificial Intelligence' (system able to handle any generalized task, like human) referred to as 'Singularity'. Although General AI seems far out of our reach today, Narrow AI is currently in use touching almost all aspect of life. Therefore, as a human species, we are entitled to plague the right part for Narrow AI elements to construct a constructive future. Artificial Narrow Intelligence (Weak AI) - is the weakest form of AI that is capable of doing one task at a time. This intelligence uses the logic-driven process to focus and replicate human behavior specific to one task at a time. Currently, most of the AI applications are operating on narrowly defined scopes of weak AI. Artificial General Intelligence (Strong AI) - is a level of intelligence that matches human intelligence that is capable of performing multiple intelligent tasks using cognitive capabilities for decision making. Strong AI gives birth to machine's consciousness and mind that can intellectually perform any task with applied intelligence that matches humans intelligence. We are yet far from reaching the general level of artificial intelligence, but it seems no far with world's giant companies researching and contributing to achieving it. Artificial Super Intelligence - is intelligence that outsmarts human intelligence in all terms, from creativity to wisdom, to problem-solving. This level of intelligence is seemingly a threat to human race extinction where machines will exhibit intelligence that no human has been able to achieve. However, it's more of a 'science fiction', as of this date. Machine Learnings (ML) is a part of Artificial Intelligence and a subdiscipline of computer science and application to develop tools and techniques that enable machines to process and learn from data using mathematics. ML includes writing algorithms, models, and tools to enable machines to learn that finds a wide range of applications, especially in prediction and classification. Deep Learning Platforms is a part of Machine Learning that is inspired by the way the human brain functions depicted in terms of Artificial Neural Networks (ANN). ANN uses human neural-like architecture of multiple levels for abstraction to learn and correct patterns in input data to give desired output to be used for recognition and classification. The application of deep learning includes image and speech recognition, natural language processing, classification, and prediction. Natural Language Processing (NLP) is enabling interaction between machines and humans using text analytics, machine learning and statistical methods to process sentence structure and decode meaning which is applicable as virtual assistance in profound products like - Apple's Siri, Google Assistance, Microsoft's Cortona and Amazon's Alexa. Robotic Process Automation (RPA) is machine automation to do handle assigned high-volume and repeatable tasks based on rules and engines to mimic a human worker. RPA have application is various domain such as - customer service, financial service, accounting, healthcare, etc. It's like Artificial Intelligence is unfolding itself and applying to all sort of technologies apart from aforementioned, such as - biometrics, image processing, speech recognition, AI optimized Hardware, social intelligence, perception, and so forth with new examples coming out everyday and tacking new problem with market disruption. Cybersecurity: Artificial Intelligence found various application in cybersecurity defense. For instance, AI monitors network traffic to map patterns of security flaws that beats traditional firewall rules to detect threats without the knowledge of signature. Other application of AI in cyber security solutions includes - spam filtering, fraud detection, secure user authentication, intrusion detection, and more. Healthcare: AI has influenced and modernized health industry with everyday applications to improve treatments and minimize cost in all medical fields such as diagnostic help, alerts, and notification based on observation, monitoring and detection, image recognition and interpretation via x-rays, MRI, CT and angiograms, and so forth. Manufacturing: Improved efficiency or product quality, AI have made significant innovations in the field of manufacturing from manufacturing supply chain, predicting market demand, predicting malfunctions, equipment maintenance, tracking operating conditions and so much more. It seems that the manufacturing section is a perfect fit for AI even at such an early age of Industry 4.0 revolution. Business: In the world of business, AI is enabling businesses to work more efficiently and smartly, doing more with less. 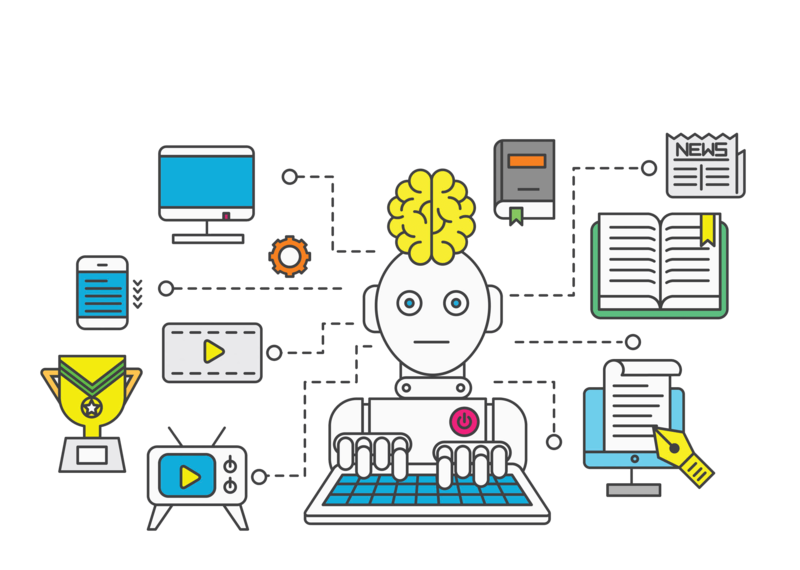 Artificial Intelligence is capable of automating almost all part of business ranging from business intelligence to the end-to-end solution, to analytics processes. In business, AI finds a wide range of application such as - fraud detection in finance, customer support in retail and commerce, security against cyber-attacks, manual process automation, and so forth, to empower organizations to achieve more. Farming: The food production with increasing population is hard to cope up. However, AI is contributing to food production efficiency with reduced wastage and minimal damage to the environment. Agriculture is finding great application for AI in terms of tilling, planting and fertilizing processes with reduced chemical usage and increased productivity. These are few of AI applications while AI is applicable to all sectors and industries. In fact, AI is fundamentally a new technological approach to all of our day-to-day problems and the journey to machine intelligence has just begun! Brain-computer interface is Elon Musk's latest startup to merge human brains with the computer as an interface to cure diseases which are not curable today. Studies report that by the end of 2020, there will be more than 21 billion IoT connected devices with intelligence systems. Nervana Chips are new generation chips inspired by the human brain to learn of its own that enables computers to make a decision-based on association and patterns. Facebook R&D team is working on software to understand our reality from watching videos, enabling machines to decode the meaning of our words. Google is working on a pill that can detect diseases such as cancer in our body much earlier than ever, traveling through our bloodstream to identify malignant cells. Microsoft is working on AI that can detect human emotions. The possibilities are limitless and the future looks promising. The increasing processing power, big data technologies, robotic process automation, automated transportation, smart cities, augmented reality, and others; Artificial Intelligence technologies are breaking-through all technological boundaries with innovation and inventiveness having the potential to change almost everything. AI is no longer futuristic, it is happening at the moment and is excelling to its full potential. The idea is not to replace our existing processes, but to augment and improve to work smarter, which applies to all AI technologies be it - computer vision, machine learning, RPA, NPL, etc. However, it is also true that AI can be subjected to misuse as acquiring human cognitive abilities does pose a threat to human well-being - but, we are yet far to reach such intelligence and we do not know. The more we explore AI, the clearer it becomes that it is a powerful tool requesting great responsibility. Today, although, we reside in the era of Narrow AI which is getting more sophisticated and complex, it seems okay to envision a future driven by both humans and machines, together.